Are you a Bitcoin holder? – Claim your free BTX now! 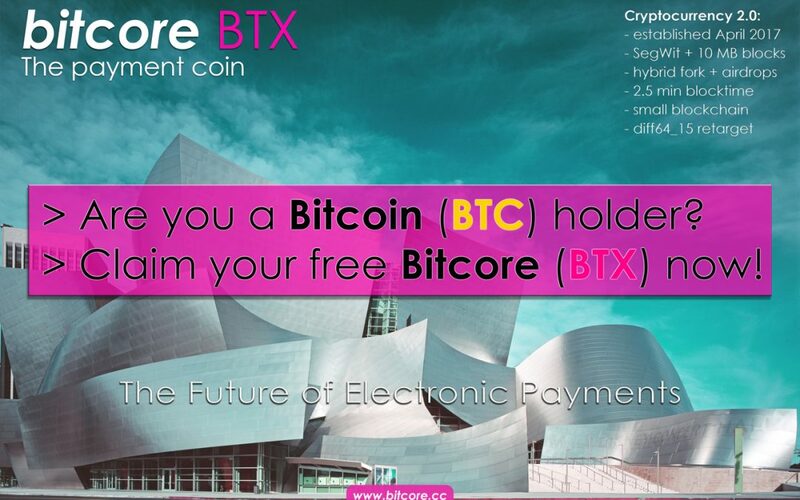 Bitcore is one of the first known cryptocurrencies to use the hybrid fork method to distribute BTX to Bitcoin holders. Instead of forking Bitcoin at a specific block and copying the blockchain, Bitcore created a new coin with an empty blockchain. On the 2nd of November 2017 a snapshot of the Bitcoin blockchain was created and in the following days approx. 5 000 000 transactions were created to fill all addresses (public keys) on the Bitcore blockchain, that had funds of 0.01 BTC or above on the Bitcoin chain. The funding ratio is 0.5 BTX : 1.0 BTC. by exporting your Bitcoin private keys and reimporting them in a Bitcore wallet. Depending on the Bitcoin Wallet you use, there are several ways to get your private key. Usually they are hidden for the normal user, because there is no reason to directly access them. However you will find ways to extract them via advanced options. We recommend to make a quick google search for the wallet you are using. Please note: Many BTC webwallets and exchanges don’t give access of the private key to the user. Unless these services support our snapshot by distributing BTX to their users, it won’t be possible to access your private key to claim your BTX. This is one of the reasons we always advocate to use a wallet that gives you full control of your keys, such as for example Electrum. Right now importing a private key for Bitcore is only possible with the Bitcore Core wallet (download here). Now you are ready to import your private key. Enter “importprivkey [yourbitcoinprivkey]” (without the “” and without [ ]). Make sure there are no spaces in your private key. Done! Your wallet should now contain 1/2 the amount of Bitcore you had in Bitcoin! The simplest way to get access to all your private keys from your Bitcoin Core client is to simply copy your wallet.dat file into your Bitcore Core folder. This way the client will automatically show all your corresponding BTX balances after syncing with the network! Important: Be sure to backup your wallet.dat before doing this! Time to enjoy your free BTX. Learn more about our cryptocurrency in the FAQ section. Rest assured, the airdrop will arrive on Monday. It is probably only a matter of minutes or a few hours until you will receive your BTX in your wallet. I registered for the airdrop and successfully got 2.35 bitcore last week. I check my balance this morning and no airdrop has gone through. I went to the registration page, entered my address and sign message for the airdrop. It said I already registered. Should I be entering a new address every week? Başka siteden kazandıgım bitcore yi nasıl alırım? sorry please ask again in English or German. today 26.03.2018 I have in the wallet 774 btx anstadt 7% to get I have again received less than expected unswar 32 btx can tell us any weird what the problem may be? The airdrop ends 30th of April 2018. The final airdrop will be on 30th of April, next Monday. I received no AIRDROP today… Registered, with almost 1000 verified coins on wallet address, –Why no drop for my address? $20+ Million already unloaded today, since the “selective” airdrop.. Obviosuly I feel I’m left holding the bags with no AirDrop in sight…. Was I the sucker? There was a slight hickup in the airdrop script. Over 99.9% of all registered addresses got paid. However we also fixed the missing addresses and rewarded them with a small extra BTX on top. as per the above conversation above, it seems like the airdrop was till April 30, 2018. Is it possible to claim BTCX now? As a bitcoin holder you can claim BTX if you had BTC during the time of the November snapshot. Please refere to our FAQ for more info. how i can claim ???? Please read the guide. If you have any specific question, feel free to contact us again. Thank you. Can you pls advise me on how to claim the airdropped btx if I had my bitcoins in a Segwit address in Ledger wallet at the time of the snapshot ? Please refere to this guide: https://bitcore.cc/claim-hw.php Use at your own risk! If you need any assistence help, let us know.